LOS ANGELES (AP) The Phoenix Suns weren’t about to go down for the third time without a fight against the Los Angeles Lakers. Devin Booker hit six 3-pointers while scoring 33 points, and the Suns beat the Lakers for the first time in three meetings this season, 122-113 on Friday night. Tyler Ulis scored 16 points for the Suns, and the diminutive point guard also got into an aggressive shoving match with Lakers guard Kentavious Caldwell-Pope near the Phoenix bench with 3:17 to play. Ulis, Caldwell-Pope and Suns rookie Josh Jackson were given technical fouls following the fracas. According to Ulis, the Suns’ strong effort was all about payback for two previous losses to the Lakers in the past month. These two young teams have had extracurricular altercations in each of their meetings this season. After this one, the Suns calmed down and pushed on to avenge their home loss to the Lakers on Monday. Jackson eagerly rushed in to confront Caldwell-Pope, while Lakers rookie Lonzo Ball created yet another immediate viral online sensation when he walked away from the drama. Alex Len had 17 points and 18 rebounds for the Suns, who won for just the second time in eight games. Phoenix bounced back impressively after giving up 142 points in a home loss to Houston one night earlier. Rookie forward Kyle Kuzma scored 28 of his career-high 30 points in the second half for the Lakers, who committed 20 turnovers while losing for the fifth time in six games. Brook Lopez had 19 points and 10 rebounds for Los Angeles. Ball had a quiet six points, six assists and six rebounds in 38 minutes. 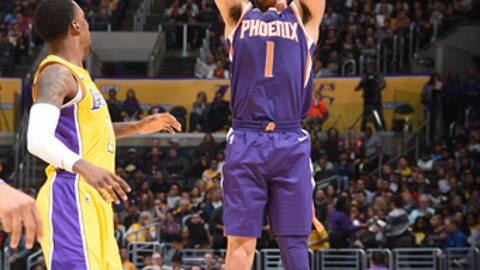 Suns: Big man Dragan Bender celebrated his 20th birthday with 10 points and five rebounds. … Greg Monroe had six points and one rebound in his second appearance with the Suns. … Big man Tyson Chandler missed his second straight game with a respiratory illness. Lakers: Larry Nance Jr. has been cleared to return to practice earlier than expected. The forward broke his left hand Nov. 2 and was expected to be sidelined four to six weeks. … Kuzma’s sixth 20-point game is the most among NBA rookies. Kuzma, who also had 10 rebounds, set a new career high in points for the second straight game with a dynamite second half. The rookie from the University of Utah became the first Lakers rookie to get 30 points and 10 rebounds in a game since Magic Johnson did it in 1980. One night after giving up 90 points in the first half to Houston, the Suns yielded a measly 53 first-half points to the Lakers while jumping out to a 12-point lead. Booker nailed two 3-pointers in the final 14 seconds, with Ball’s first field goal on a layup sandwiched between them. Suns: Host the Chicago Bulls on Sunday. Lakers: Host the Denver Nuggets on Sunday.